Some people have symptoms which fall into more than one of these categories, and more than one type of a headache may be present at the same time. Medication overuse headaches or rebound headaches are due to taking too much pain medication, which results in the opposite effect: rather than getting rid of the pain, it makes it much worse. In fact, these headaches can be more intense than a migraine. Medication overuse headaches may get better right after taking the pain medication but then come back with greater intensity. If you have a new type of a headache occur or if they are accompanied by fever, weakness, stiff neck, vision changes, vomiting, a change in behavior, or a change in sensation on one side of your body, it is a good idea to seek medical attention as soon as possible. These symptoms can indicate a serious infection or other serious health condition. Dr. Raymond Damadian invented the upright MRI. This machine has done wonders in helping researchers learn more about headaches and how they originate. Using the upright MRI, Dr. Damadian was able to prove that a misalignment in either of the top two bones of the neck (the C1 or the C2 vertebra) can actually change the flow of cerebrospinal fluid (CSF) leaving and entering the brain. Why does this matter? 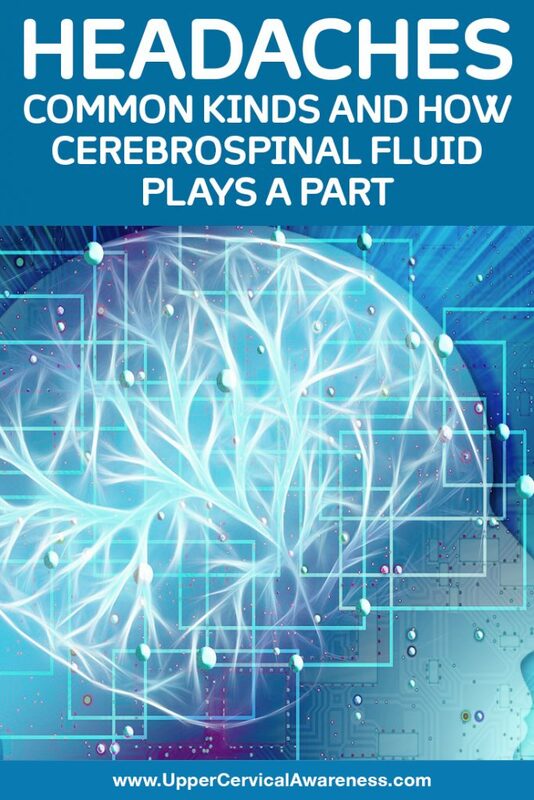 Cerebrospinal fluid is a clear, colorless body fluid that is found in the brain and the spinal cord. It acts as a cushion or buffer for the brain and provides immunological and mechanical protection to the brain inside the skull. It also has the important job of regulating blood flow in the brain. Therefore, if a misalignment is hindering the proper flow of blood and cerebrospinal fluid from leaving or entering the brain, many problems can ensue, such as headaches. Too much CSF can lead to intracranial pressure. Not enough leaves the brain vulnerable to injury. A study was conducted observing two patients who complained of migraine headaches. Interestingly, both of them had prior whiplash injuries. After the whiplash, headaches and other health problems began. The upright MRI and a special software program were used to observe the flow of cerebrospinal fluid. In both patients, it was found that the CSF between the brain and body was significantly reduced. Another observation made was that each of them had a misalignment in their C1, or atlas, vertebra (the very top bone of the spine). After determining what was the possible cause of their headaches, it was now time to try to correct the problem and bring them back into a healthier condition. An upper cervical chiropractor was called in to give them an adjustment to correct the C1 misalignment. An hour passed after the adjustment and each patient underwent another scan from the upright MRI. Surprisingly, their cerebrospinal fluid was back to normal! The patients also reported that their head pain was just about gone at this point. What exciting news for those suffering from migraines and other headache types! What do we learn from this information? A misalignment in the upper cervical spine can hinder the proper flow of cerebrospinal fluid to and from the brain, leading to migraines and similar headaches, neck pain, tingling and numbness, and other nagging health problems. Upper cervical chiropractors understand the importance of the proper alignment of the top bones of the neck. The C1 (atlas) and C2 (axis) vertebrae were specially designed to act as a protector for the delicate brainstem and spinal cord. Their unique shape makes them a kind of housing for the brainstem, to keep it safe from damage. However, if you have endured a trauma to the head or neck, even if it was many years ago, these bones can put the brainstem under stress and cause it to send improper signals to the brain. Additionally, as we have seen, a misalignment here can act as a kind of blockage to the flow of both cerebrospinal fluid and blood. By correcting this problem, many patients see relief from their headaches as in the above-mentioned studies, sometimes in as little as 1 or 2 adjustments. But how do we do it? Rather than popping or cracking the neck and adding further stress to the body, we use a gentle method that is based on scientific measurements. Because this is such a delicate area, we encourage the bones to move back into alignment on their own. This leads to a longer-lasting adjustment and no discomfort to our patients. The end result? Relief of headaches and migraines in most cases!